You are on the journey of peace perhaps you think you have a choice you don’t. From the moment, you take your first breath until you take your last you will never stop seeking peace, never. All the riches in the world and all that those riches can bring will still leave you hungering for peace. From a world that uses Peace Keeping Forces as a way of seeking peace we cry out, what is peace. In response to our question God gives us the life of Jesus to illustrate the contrast between peace as the world understands it, and peace as the He means it to be. To seek peace means to go beyond looking for a place to rest our weary bodies it means seeking a place to rest our souls. To seek peace is to go beyond seeking riches from the world it means seeking a rich relationship with your Heavenly Father. To seek peace is to go beyond seeking for worldly power it means tapping into the power of the Prince of Peace. There are two final destinations awaiting our journeys end. One will be peaceful built by Jesus Christ when he died on the cross, it is called the Mansion of Peace, and your room will be ready where you will experience peace beyond what the world can give. The other destination will be anything but peaceful. Heavenly Father, it is with much sadness that we pray for peace, sadness because peace has always been available to us. Yet for eons of time our world has sought peace only to find fleeting glimpses of it. Many times we have prayed for world peace and failed to see that world peace begins with individual peace. 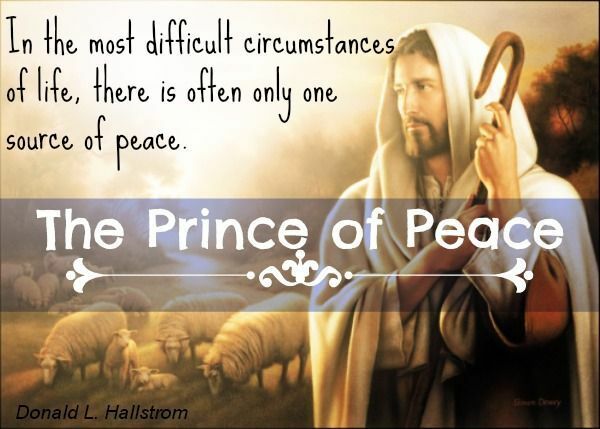 We are further saddened because so many people in our world have not been introduced to the Prince of Peace, and so many who have only a surface contact with him. But Lord we look beyond our sadness and we pray in hope and we pray with the vision given to us and lived through us by your Son Jesus Christ. This hope and vision is burned into our whole being through the power of your Holy Spirit, that same Spirit that links each of us, one with another. That same Spirit that plants deep within us the hungering for the peace that passes all understanding. We pray in faith believing that respect and understanding for each other are the only ways to silence weapons of war. We pray in faith believing that powers and principalities of the world are powerless when confronted by the awesomeness or your Power. We pray that your Holy Spirit might unify us so we can stand ready to grasp the hand of Jesus and show the world what true peace really is. AMEN!